8hp and 10hp engine main bearing cap nuts 45 to 50 lb./ft.- 60 to 67 Nm. big-end cap OEM nuts 30 lb./ft.- 40 Nm. big-end self locking nuts 20 to 23 lb./ft.- 27 to 31 Nm. 100E engine main bearing bolt 55 to 60 ft./lb.- 74 to 81 Nm. big-end cap, OEM nut 20 to 25 lb./ft.- 27 to 33 Nm. big-end self locking nuts 3lb./ft.- 4 Nm. 105E/123E engine main bearings 55 to 60 ft./lb.- 74 to 81 Nm. big-end cap 20 to 25 lb./ft.- 27 to 33 Nm. Please Note :- for our replacement con rods E93A-6200-REP and 100E-6200-REP with cap bolts, these should be tightened to 28 lbs ft with Loctite Threadlocker or equivalent applied. early pattern piston to crankshaft connecting rod with small 9/16" (14.29mm) diameter piston pin bush. machined to size specified. we have standard available from stock at reduced price. replacement crankshaft pulley for 100E engine, made from solid . only fits to fibre gear driven camshaft engines - NOT the chain driven camshaft later type. new manufacture aluminium rear bearing upper crankshaft oil seal, aluminium half moon housing that fits into the block and channels excess oil back into the sump. aluminium rear bearing upper crankshaft oil seal, aluminium half moon housing that fits into the block and channels excess oil back into the sump. aluminium rear bearing lower crankshaft oil seal, aluminium half moon housing that fits into the sump and channels excess oil back into the sump. new re-manufactured timing chain crankshaft sprocket, 20 teeth with timing mark. end clip to retain standard piston pin into piston end. set of 4 pistons complete with rings, pins, clips etc. available in various over sizes. 105E-6102-060 - piston set - oversize 0.060"
105E-6102-0025 - piston set - oversize 0.0025"
105E-6102-005 - piston set - oversize 0.005"
105E-6102-040 - piston set - oversize 0.040"
105E-6102-020 - piston set - oversize 0.020"
105E-6102-030 - piston set - oversize 0.030"
little end bush. 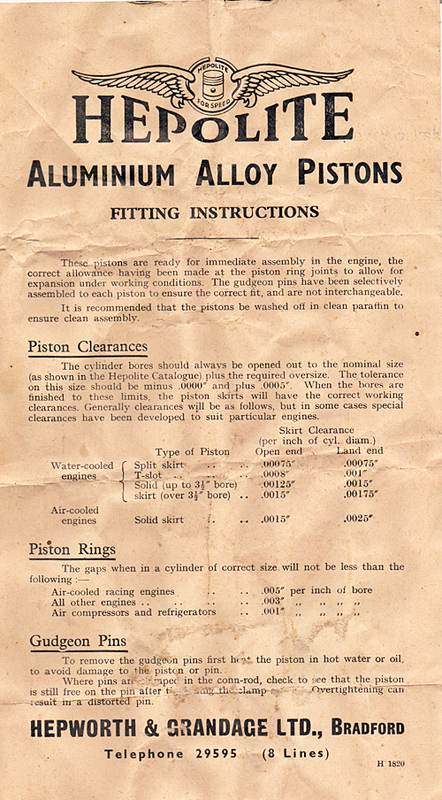 please note that this will require final ream and hone to suit piston pin once pressed into place, dimensions 22mm long, 18.7mm o/d, 17mm i/d. timing pin tool which locates the timing indent on the timing chain spocket, screws into timing cover when not in use. replacement cylinder liner sleeve for engine block. good used starter dog bolt, screws through front pulley and accepts the starter crank handle. shallow nut used on model Y & C.
good used starter dog bolt, screws through front pulley and accepts the starter crank handle. deep nut used on all 8/10hp models 1938-59.
one each both top & bottom. specify thickness. standard thickness measures approx 2.35mm. stocked in standard, +0.005" and 0.010". set of piston rings. available in standard, oversize 0.020" (+20), oversize 0.030" (+30), oversize 0.040" (+40), oversize 0.060" (+60). supplied as a 3 or 4 ring per piston engine set. 105E-6149-0.020 - piston ring set 105E - 0.020"
105E-6149-0.040 - piston ring set 105E - 0.040"
105E-6149-0.045 - piston ring set 105E - 0.045"
specifically sized for use once +90 thou oversize has been reached. set of piston rings. available in standard size, oversize 0.010" (+10), oversize 0.020" (+20), oversize 0.040" (+40) , oversize 0.050" (+50). supplied as a 3 or 4 ring per piston engine set. set of piston rings. available in standard, oversize 0.010" (+10), oversize 0.020" (+20), oversize 0.040" (+40) , oversize 0.050" (+50) . supplied as a 3 or 4 ring per piston engine set. conrod little end bush. please note that this will require final ream and hone to suit piston pin once pressed into place, dimensions 26.5mm long, 22.4mm o/d, 20.4mm i/d.